Attn: I estimated the course layout and difficulty level as if I had played from the 7040 yard black tees. In fact I actually played from the 6660 yard blue tees about 400 yards shorter. This is a woodland course in a suburb of Sydney. Natural forests line gently conjured fairways, enhanced with native shrubs and flora. The layout of lakes, creeks and bunkers is superb and challenges you to conquer the course. It is laid out on almost flat terrain with few ups & downs, but has a lot of undulations across the course. It is suitable for intermediate and advanced players because of the narrow fairways and water in play on almost every hole. It was regrettable that many ducks walked on the greens, although they’re cute, but left scattered droppings on around 5 out of 18 holes. It is a pity that the manicured greens become bumpy because of the ducks. I hope that the club management will improve this problem. An almost straight hole. A precise tee shot is needed as the fairway is tight. The second shot needs to be accurate, too as the green is guarded by a bunker in the front, 3 bunkers on the right and a lake on the left. The green slopes from the right to the left lake. A relatively long par 3 surrounded by trees. Deep bunkers on both sides guard the narrow and elevated green, so an accurate shot is required to get a par. A dogleg to the right with a green swung further to the right. The green slopes from back to front and is elevated, and its front is protected by a deep bunker and a small pond. A relatively short, straight par 4. The tee shot is intimidating as the landing area off the tee is squeezed by a large bunker on the right and trees on the left. The double-tiered green is shallow and not deep, so you need to hit with lots of backspin. A challenging dogleg to the left. Water comes into play along the entire left side of the hole, so a right to left player needs caution. 2 bunkers on the left corner are in play off the tee, too. The slightly elevated green is double-tiered and slopes from right to left. A beautiful par 3 over a lake. The green slopes from the left to the right water. When the pin is on the front right, watch out for a deep bunker which can catch a shot short. Fading the ball and hitting it toward the front right pin, the slope often rolls it down to the water. An almost straight hole. The fairway slopes from left to right. The elevated green is double-tiered and protected by bunkers on both sides, so an accurate shot is needed. An approach shot from behind the green is difficult, so also be careful of hitting over the green. A slight dogleg to the right with a green swung to the left, a demanding hole. Bunkers on the right and deep hollows on the left should be avoided off the tee. You can’t see the green from the hollows and the rough is thick where it is hard to hit a good shot. A lake protects the front of and the right side of the green. If your tee shot isn’t good, a lay-up second shot could be a wise option. It is a hole where you are very happy with par. A sharp dogleg to the left from the second shot area. The tee shot is intimidating as the landing area is narrow with an OB on the left and a lateral hazard on the right. Bunkers on the left corner come into play, too. The second shot is uphill to hit toward the clubhouse. The shallow green calls for the right club selection and good execution. It is a 40 minute drive from Central Sydney and a 1 hour drive from airport. Visitors can play with a member’s introduction on weekdays and must be accompanied by a member on weekends. The distances are in meters. You can freely choose which tees you want to play. 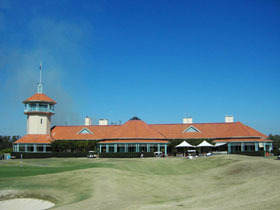 The course is ranked 26th in Australia by GOLFSelect 2006. The other Graham Mash and Ross Watson designed courses in Australia are The Vines G&CC (Composite course, 27th of above ranking), Horizon GR (63rd), Paradise Palms GC (67th) and Robina Woods GC (99th). Ross Watson alone designed Magenta Shores GC (27th in 2012), Pacifc Harbour G&CC (56th in 2012) and Indooroopilly GC. The works of Graham Mash in Asia are as follows: Penang GR, Tropicana G&CC, and Staffield CR and Stera Harbour G&CC are his designs in Malaysia, Fairways & Bluewater RG&C and Royal Northwoods G&CC are in the Philippines, Gading Raya Pading GC is in Indonesia, Silk River CC is in Korea, BFA International Convention Center (博鰲論壇亞州国際会議中心) GC is in China and Mission Valley GC, Kagoshima Gaden GC and Karuizawa 900 C are in Japan. On the other hand, the works of Ross Watson in Asia are mainly in Malaysia and 5 courses are selected within top 20 best courses by the Golf Malaysian readers’ poll in 2004. Those are the 2nd Kota Permai G&CC, the 3rd Staffield CR, the 10th Impian G&CC, the 14th A’ Famosa GR and the 16th Tropicana G&CC.